People come from all over to hear jazz at LACMA on Friday nights. And not just any jazz, says Mitch Glickman, director of the series, celebrating its 25th year this month. When Glickman took the helm 11 years ago, he made a covenant that only Los Angeles-based musicians would take the stage. The city’s diversity, weather and the studios are what make the difference, he says. Glickman chooses from among Grammy-award winners to the up and coming to play in the weekly shows. No two weeks are the same, he says. He carefully selects “straight-ahead” jazz, acoustic, traditional and instrumental acts, with the last week of the month featuring a vocalist. But as good as the music is, it’s the community feeling that draws enthusiasts from Covina to Santa Barbara. Some 42,000+ visitors attend the concerts held through November. Seating is limited, traffic can be tough, but visitors find room anywhere and everywhere. “It’s a celebration of Los Angeles,” says Glickman. While minimal, funding is from donors and the county, the latter thanks to former Supervisor Zev Yaroslavsky and current Supervisor Sheila Kuehl. This season will have 31 acts, kicking off with Les McCann & Friends on April 22. Tierney Sutton with special guest Mark Summer is April 29. Eric Reed Quartet plays May 6 followed by bassist Pat Senatore May 13, an original member of Herb Alpert’s Tijuana Brass. The jazz series begins at 6 p.m. and is free. Programs can be heard Sunday at 7 p.m. on 88.1 KJAZZ.1. Glickman, a composer and conductor—he conducts the 67-piece Symphonic Jazz Orchestra—also directs Latin Sounds, a summer series he launched 11 years ago. Held in Hancock Park behind the museum, Latin Sounds begins Sat., May 28 at 5 p.m. with the Echo Park Project. The jazz and Latin series are part of the museum’s Dept. 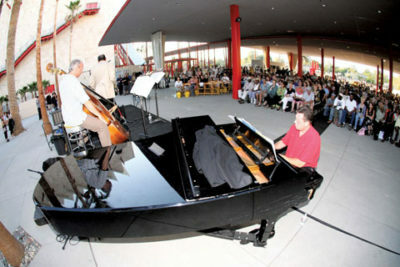 of Music Programs, a seven-time national winner of the ASCAP/Chamber Music America Award for Adventurous Programming. Sundays Live features live classical music year round in the Bing Theatre. The series directed by Bill Vestal predates the museum, says Glickman. Three of LACMA’s four music programs are free. The Art & Music series has a fee. For more information, call 323-857-6000 or visit LACMA.org.